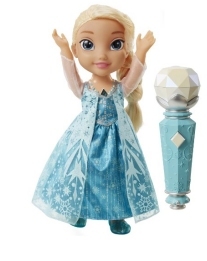 Sing-a-Long with Elsa from the Disney film Fozen game is one of the must have toys for Christmas 2015. We constantly track for stock which ensures you will be the first to know when availability is found. Frozen Sing A Long with Elsa allows your little ones to join in and sing the hit song "Let it Go". Just the move the microphone close to Elsa to set her off singing, move the microphone away and start singing yourself, move it back to Elsa again and she carries on where you left off. Dimensions Height 38.5Cm x Width 14.0cm x Height 10cm. 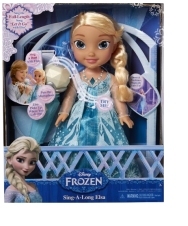 Requires 3 x AAA batteries for Elsa and 2 x AAA batteries for the microphone which are all included. We constantly check for Sing-a-Long with Elsa stock, so you don't have to. Receive email alerts when Sing-a-Long with Elsa online stock is found.